Tonight's gig is a co-headlining one with both bands playing for an hour. 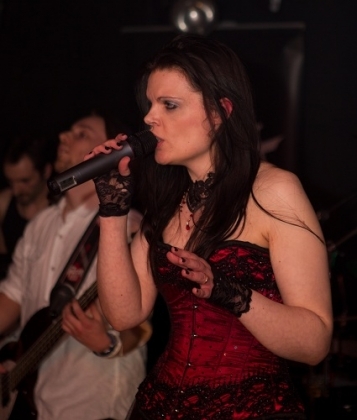 First up was Crimson sky, a female fronted prog rock band from Bristol. I did enjoy their set but there was certainly room for improvement - the keyboards were way too high in the mix and at times drowned out the vocals. The guitar work was good and heavy. The singer moved around and used the space well and her voice seemed pretty good, but during one of the old songs that was written when the band had a different singer then she did seem to struggle, which isnt unusualy when singing somethign written for someone elses voice. The band failed to get much engagement with the crowd unfortunately with most people standing well back, but there was still plenty of applause between songs. Winter in Eden are a band I've seen a few times, but this was my first time since their new drummer joined. I hadnt expected a change of member to make sucha big difference but the band seemed to have been given a new lease of life. Last time I saw them the guys were playing well but there was little enthusiasm evident and they hadly moved. This time however they all seemed to be having a great time and moved around a lot more. The new drummer who joined from Marshall Law, has very exaggerated movements so is constantly moving and his arms are flying in wide arcs whereas some drummers have a very economical style making as little movement as they can while still playing the required strokes. Vicky did a good job of getting the crowd to come to the front of the venue and keeping them engaged during the set. THey put in a great set, and Vicky certainly deserved a break when they played an instrumental - Windelfell, from the first album. Both bands did well tonight, but for me Winter in Eden were by far the best band on the night.